Anders Gillis at the start of the 2018 Vasa race. He’s 6-foot-4, and when he lined up his skis at last year’s Vasa race, he was wearing orange-tinted glasses. They were to protect his eyes from thrashing ski poles. Anders says you have to know when to hold back in a race and when to go hard - and 21 miles is a long way to go. "I've been skiing since I can remember walking really." 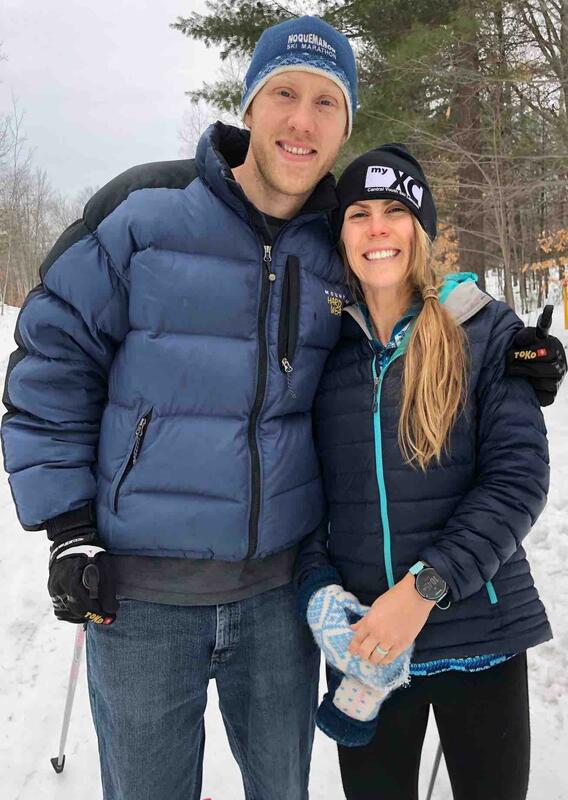 Anders and Amanda Gillis in January 2019. He learned this tactic as a kid skiing in Alaska. That’s where he grew up and where he met his wife Amanda. She was his high school sweetheart. Amanda says Anders was always a star. Anders went on to ski at the University of Alaska and Northern Michigan University. “Skiing was almost in my DNA growing up,” Anders says. “I’ve been skiing since I can remember walking really. One winter, he jumped at the opportunity to live in Sweden where he holds dual citizenship. His mother is from there. "I got to hang around with my 80-year-old grandma and go ski around northern Sweden a little bit with her, which was just a really cool experience," says Anders. 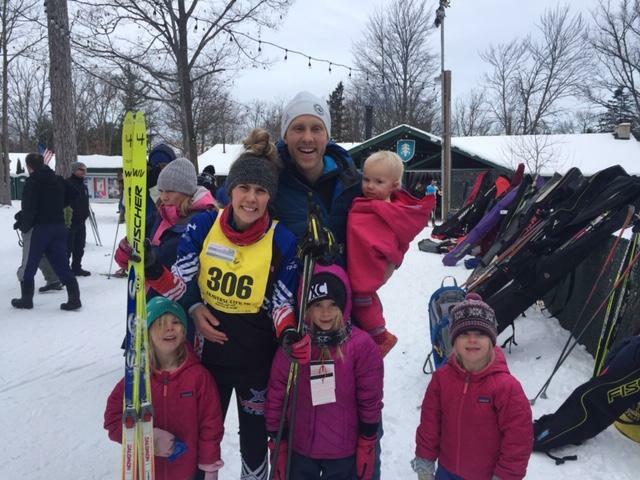 After law school, Anders and Amanda moved their three daughters to Traverse City. They love it here, especially being able to ski out their back door. Life was great for a couple of years, but then they experienced tragedy. "In 2015, I had a daughter that was born very, very prematurely, and she spent ten months in the hospital before dying on December 3, 2015," Anders says. That was ten challenging months of juggling work, family and hospital visits to his infant daughter Elin. “After my daughter passed away, I was just kind of realizing I needed to reset myself a little bit and recalibrate my entire life." Anders says he had a strong support system, but things were still tough. “I got into just a terrible spot there mentally and emotionally,” Anders says. “In hindsight I really should have gone in for counseling or gotten some sort of medication, but I didn’t." In the midst of depression and grief, Anders gained 50 lbs. At 6-foot-4, he hid it well but he didn’t feel well. “After my daughter passed away, I was just kind of realizing I needed to reset myself a little bit and recalibrate my entire life,” says Anders. His wife Amanda encouraged him to get outside to ski. She knew it would be good for his soul. “To get out in the woods where you’re all alone in the winter is just a magical thing and can be very therapeutic,” says Amanda. Anders says part of his therapy was going out on the trail and hanging with friends. He was skiing a lot, sometimes late at night. “I was doing a lot of two hour, even three hour skis, and you start skiing that much, you’re going to lose weight,” says Anders. Anders lost 50 pounds and got in great shape for last year’s Vasa race. Amanda says he discovered a freedom to be able to do what he loved again. Anders Gillis won the North American Vasa 34-kilometer classic race in 2018. During that race, Anders got off to a good start. He was in the front pack, but still behind a few skiers. About three quarters of the way through the race, he took the lead. When he came into the home stretch, Amanda and his daughters were waiting for him. As for this year’s race, Anders says just getting across the finish line feels like a good goal. “For me, cross-country skiing, being able to smoothly glide through the trees and enjoy nature, how can you beat that?” says Anders. But Anders says if he’s really being honest with himself finishing in the top five would make him happy. At Gary Michalek’s house, food scraps don’t go into the trash can. Kitchen waste goes into the worm bin. The master gardener from Benzie County does vermicomposting – a technique that uses earthworms to recycle food scraps into nutrient-rich humus. Michalek says the recycled soil is like fertilizer on steroids. When picking plants for your garden next spring, be careful about what you choose. A species called Japanese knotweed has been known to eat people’s houses. Well, not literally. But Emily Cook with the Northwest Michigan Invasive Species Network says knotweed roots grow through roads, sidewalks – and yes – even homes. When it comes to wood carving, you can’t just pick up any old piece of wood off the ground and expect to do something nice with it. That’s what Lake Ann resident Jack Hannert says. He recommends using green wood – that is, wood that has been cut recently from a tree. Bob Tarkington always wanted to go to music school. So when the Frankfort summer resident retired, he decided to do just that. It took two tries to get accepted, but now Tarkington is a senior in a jazz studies program in Georgia. He says it’s easy to spot him in his school choir: just look for the student with a shock of white hair. Mike Webb says he’s always been fascinated by balloon twisting – the shaping of ordinary-looking balloons into extraordinary things. The Benzonia resident is the self-styled "chief entertainment officer" for Balloon Dog Productions. In other words, he’s a professional balloon twister.